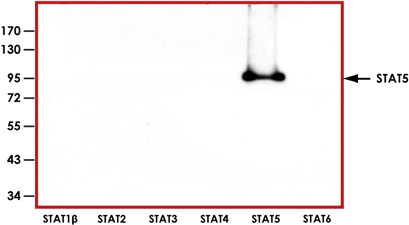 Sample Data :Representative western blot with Anti-STAT5 (1:1000) using 5 ng of human recombinant STAT1β, STAT2, STAT3, STAT4, STAT5 and STAT6. 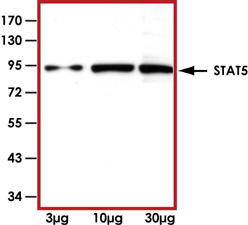 Sample Data :Representative western blot with Anti-STAT5 (1:1000) using 3 μg, 10 μg and 30 μg of K562 cell lysate. Scientific Background :STAT5 (signal transducers and activators of transcription 5) is a member of the STAT family. It is phosphorylated by receptor associated protein kinases in response to cytokines and growth factors (1). The differentiation of T helper cells is regulated by members of the STAT family. In BCR-ABL-positive cells, STAT5 is constitutively activated by tyrosine phosphorylation. STAT5 activation results in upregulation of Bcl-XL and increased resistance to induction of apoptosis. STAT5 is involved in expression and growth hormone-mediated sexually dimorphic regulation of cytochrome P450 3A10/lithocholic acid 6 betahydroxylase (2).